An attractive outdoor waste receptacle, or outdoor trash can, can make litter and trash literally disappear, and look good while doing it. It may be hard to imagine, but there are actually some elegant outdoor waste disposal options available on the market today. Whether you run a business and want a sturdy, wind-resistant outdoor trash can to help keep your business area clean, or you just want to place one on your property for backyard parties, you can find one that suits your needs. Interestingly, some people even use these outdoor trash hideaways indoors, enjoying their conveniently large capacity. The 30 gallon capacity, plastic molded, Suncast Trash Hideaway is a contemporary designed & durable option that keeps your surroundings clean with very little fuss. Its users are delighted with the large capacity of this rugged trash hideaway, but feel that it could have been designed to make it easier to remove jam-packed trash bags. This Suncast trash hideaway is the right option if you are looking for a large-sized and chic-looking outdoor receptacle for stashing away your waste. This 20.5 lb., durable steel, Crosley Trash Bin is a stylishly designed trash receptacle option that comes with UV-resistant features. Users find it a great choice because of its weather durability, but at the same time feel that it could have included a smooth inner finish to make trash removal easier. The trash bin has an inbuilt bag holder enabling a hassle free and clean trash removal. 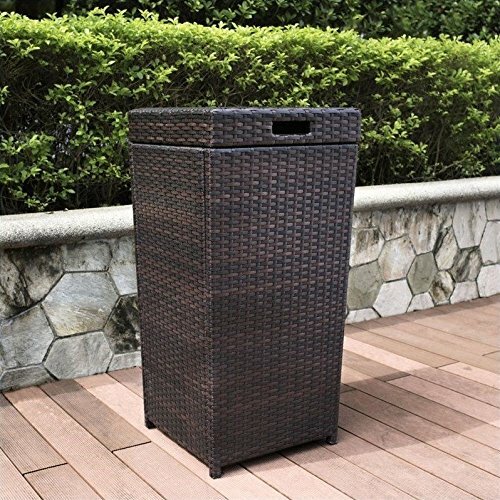 This wicker trash receptacle is a good choice if you are looking for a durable and cost effective trash receptacle. The all-weather, 30 gallon Keter Pacific Waste Basket is an efficient waste disposal can with an easy-to-clean liner. Users love the that the product keeps their outdoors and patio areas clean, while blending well with the surrounding decor. But they also note that the liner is not very effective in holding the trash bag. This metal-hinged Keter Pacific Wicker styled basket is a good option to consider if you want a weather-resistant trash receptacle and don’t care much about whether the trash bag holds well or not for heavy loads. 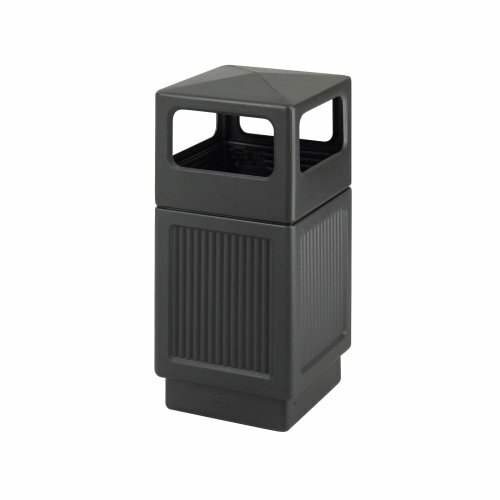 This 38 gallon, polyethylene, Safco Waste Receptacle is an especially effective option for businesses because of its storefront-friendly appearance and solid capacity. Users find the style and design appealing to the eye, but note that it is a tad light in weight. This outdoor trashcan has in built UV inhibitors making the receptacle resistant to fading and wear over a long time. This CanMeleon trash is a good choice if you are partial to a receptacle that is easy to empty and looks good. This 30 gallon, durable resin, Suncast hideaway receptacle is a stylish trash collecting option that reduces the frequency of emptying the trash. Its users find the hideaway of great use for outdoor entertaining but note that it is difficult to remove the trash bag from inside the receptacle when it is overly full. 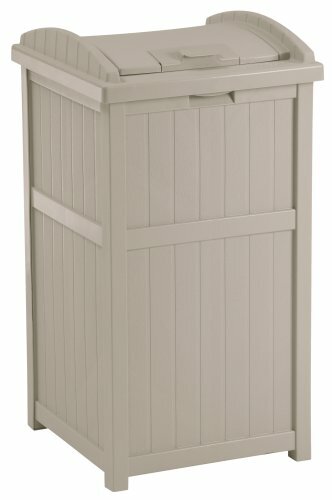 The outdoor trash can has a latching lid with faux wainscoting pattern. This stay-dry Suncast trash receptacle is a solid option if you are looking for a cheap and durable outdoor trash receptacle for your home or small business. What are users saying about their outdoor trash receptacles? One craftsman describes purchasing an outdoor waste receptacle and actually placing it indoors inside of his basement workshop. It should be noted that some of the outdoor waste receptacles that we have evaluated about 10 actually be used indoors. He writes that since it does not have a closed lid odors can escape from it as well sometimes the cats would get stuck in it. He also notes that if you live in a raccoon-populated area it's likely that the animals will begin foraging in the outdoor waste receptacle. He writes that he uses his industrial trashcan mainly for small amounts of ways like pieces of cloth, wood shavings and various scraps. Since it is so sturdy, it doesn't fall over when he makes incidental contact with it. He also likes that the Safco trashcan has a 15 gallon capacity, which means you can fill it with more stuff before having to empty it. Another advantage he noted was that since it has a covered top, it protects him from accidentally dropping things into it. A different reviewer, writing of the same Safco waste receptacle, writes that he situated it in his forest land. He mounted it on a large concrete pay stone in order to keep the outdoor trashcan on the level. This ended up being a pretty smart purchase for this particular user because it lets hikers who are in the area deposit trash at this resting area instead of potentially littering nature. As well, he commented that modern design does not clash too much with the outdoor scenery and is a decent middle ground-not to garish but functional all the same. Another Safco buyer writes that as a business owner he was looking for a sturdy and wind-resistant outdoor trashcan- he wanted one that could really take a beating and still look decent at the same time. The Safeco was an ideal option for him, he notes, because of the steel frame and side panels as well as the steel fabricated top covering. What he also liked, was that the top was easily removable and the interior can be lined with a 15 gallon trash bag or used directly for waste itself. Like another user, he didn't think this would be ideal for kitchen use because the interior is open and exposed to air. He found that insects would be attracted in this case, so he advises that it is more ideal for outdoor patio and decks or for outdoor business locations. While not the cheapest option available, if you're looking for something that is really sturdy and resistant to getting knocked over by the wind, the Safco outdoor trashcan, which weighs more than 50 pounds, is an incredibly stable and attractive option. 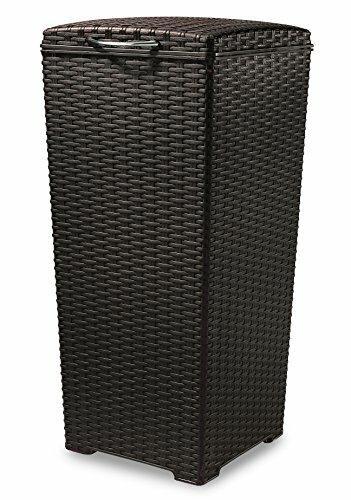 Another option that many users have investigated is the Keter Pacific wicker outdoor wastebasket. Stylistically this is a little bit different than the steel-reinforced Safco outdoor trash can. Instead, this outdoor waste disposal unit is designed to blend in with higher-and patio decor. 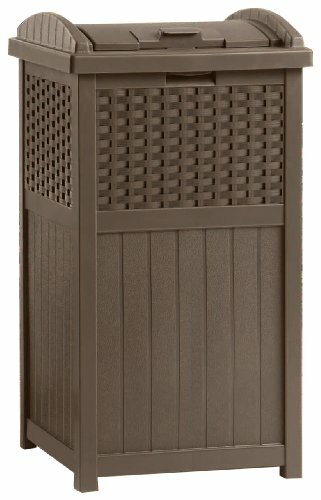 It is an attractive design alternative to more traditional-looking outdoor trash cans. Since the wicker is coated with a polypropylene resin, it's really easy to clean and does not fade or crack over time in the sun. People that purchased this outdoor wicker trash and waste receptacle on the whole have been pretty pleased with how it has performed. One writes that they have had it for over 10 years and it looks like it was purchased only two months ago. Interestingly, an elderly couple use it indoors because they don't like to take the garbage out too often, instead using 33 gallon bags to collect waste placed and only hauling that out every so often. Overall, users were happy at how awesome it looks outside and how easy it is to line it with a trash bag and remove it as well when it is full. Another style is the Suncast Outdoor Trash Hideaway. This particular trash receptacle has a matching top lid and an attractive wainscoting design. Again, we have seen some users make use of this trash hideaway indoors- with one writing it can deal with huge kitchen messes on account of its enormous capacity. This is another more elegant alternative to a bulky, florescent-colored Rubbermaid trash can. If you are looking for an outdoor trashcan waste receptacle, would it be for your business or home, take a look at the comparison table above and choose the model that best suits your needs. As we have seen, some people even use these outdoor trashcan receptacles indoors, employing them in their kitchens to absorb huge amounts of waste or for their personal workshops as a commercial grade trash can. That said, it's crucial that if you dispose of a lot of organic food matter, it's a good idea to empty that out pretty quickly because it will begin to smell and potentially attract vermin or other wildlife right into your backyard!He makes another interesting point that if you are in the habit of frequently throwing backyard parties, purchasing a couple outdoor waste receptacles and placing them throughout your property will dramatically decrease the amount of trash, waste and general messiness that occurs with throwing a big festivity. 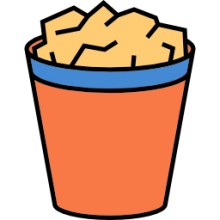 All in all, these are surprisingly attractive and sturdy trashcan options should you require an efficient and effective means of business or personal waste disposal.